Cookies & Candies: Comfort over fashion? 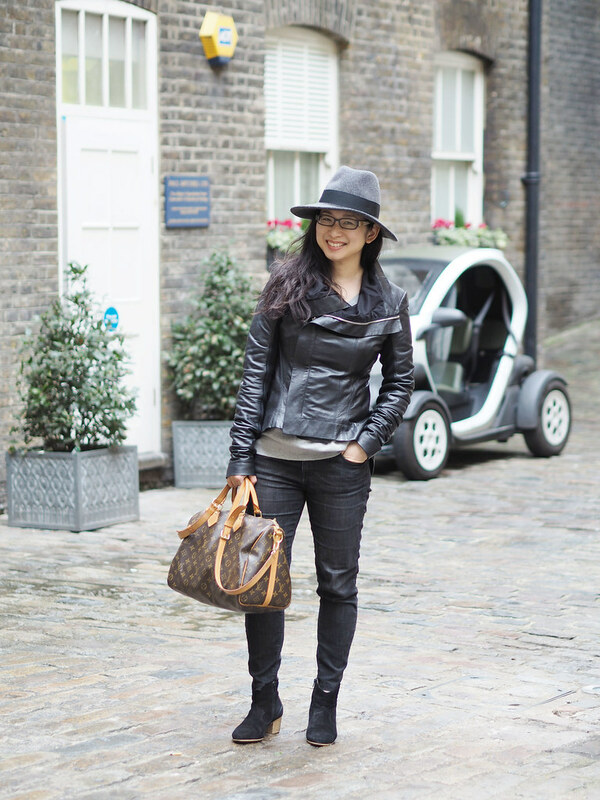 Outfit: Christys' fedora, Rick Owens Naska leather jacket, Uniqlo cotton/cashmere sweater, Icebreaker thermal vest, Zara jeans, Topshop boots, Louis Vuitton Speedy 35. In fact, I was shocked that I can actually look half decent in front of the camera. Well, as long as I don't look at the mirror first thing I get up lest I scare myself to death. Actually, it wasn't too bad. Much like applying Photoshop gaussian blur where everything looks airbrushed and fuzzy. That is........until I put on my glasses. The worst was wearing contacts. It was like.....WHOA! I really REALLY scared myself sh*tless then (I haven't worn contacts since). I made several trips to London last week, the last being on Saturday where 18 bloggers came from all over and perched ourselves in a restaurant for hours on end chatting the day away. Just in case you're wondering why I was lugging such a fat looking LV Speedy.....it was my overnight bag. Thank goodness I've downsized my camera which now takes up less space than my t-shirt. It was freezing. Okay, nothing compared to the crazy snowfall in the U.S and Canada so I can't complain. I was so grateful for my fedora because it rained....and rained....and rained. An umbrella would've been ripped apart by the wind within minutes. The Rick Owens leather jacket was a godsend too. Waterproof, windproof and kept me warm. I'm glad I didn't go with the brushed leather version which would've been ruined in the rain. I wish I could dedicate this blog as an Ode to All Things Fashion but sadly, it ain't going to happen. As you can tell, I got lazy and wore the same few outfits again and again since......erm........early December? Anyone struggling with their outfits lately? **A huge thank you to Sue of Susie So So for putting up with me when I made her take photos of me. Amen, Helen! It was a fabulous get together. I only wish we could do it more often. I can't bear lugging around that monster these days. Besides, complicated gear never interests me. Next time, let's gorge on more Laduree desserts. We need to stay at least a couple of nights. I'll be sure to organize another PJ party again. See you soon! Becky, you're a sweetheart! Literally made my day with your kind words. I was really looking forward to seeing photos of your annual bloggers meet up, on either your blog or the other "girls" blogs as you and the other used to do the previous years. This year, zilch, nobody has posted about it, how come? Most of us have been blogging for more than 3 years now. I guess in some ways, quite a large number of us have not blogged as often as before. I suppose we've all also silently agreed to not publicize about the get together. Let's just say that the alcohol bill was higher than the food bill........... For a non drinker, that's still a bit of a shock to my system!! Likewise, Andrea. Hope to see you soon again. I'm just curious: doesn't the rain "damage" the feodora? By damage, I mean the hat becomes moldy, etc, etc. So far I haven't had any issues with water damage. If it gets soaked, I'd pop the fedora near the heater or boiler just to dry it first.